As you know, we are based here in Ft. Lauderdale, FL, where last week we had a major news event, as 26 year-old airline passenger Esteban Santiago allegedly shot and killed 5 people at our local Fort Lauderdale Airport (FLL). With this huge news event going on all weekend, many of you likely missed the other airport news that occurred here also, with a lot less fanfare, and a much better ending, except for the VW executive that got arrested. 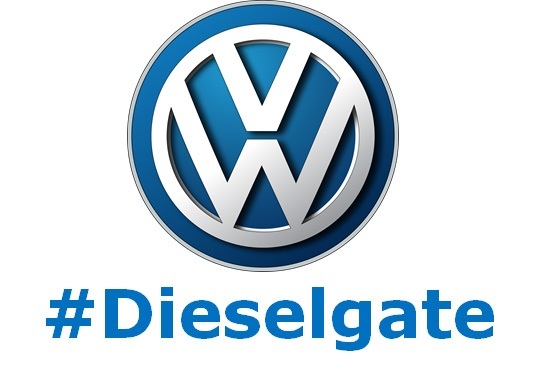 You can't make up a story better than this one, filled with arrogance, stupidity, risky behavior, diesel engines, lies, fraud, angry Volkswagen diesel car owners and overall international intrigue. 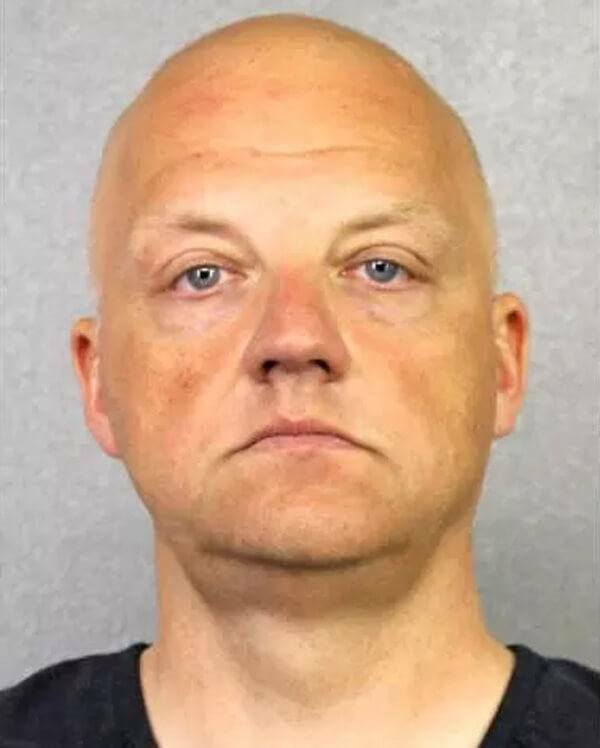 Former high level VW executive Oliver Schmidt was arrested at the gate, most likely by Broward Sheriff's Deputies and held for the US Marshals before he could board a plane back to Germany after a visit here to the U.S. The VW executive lied to investigators? The FBI complaint is suggesting he lied to regulators investigating why Volkswagen diesel cars were spewing out 40 times the legal dose of NOx. 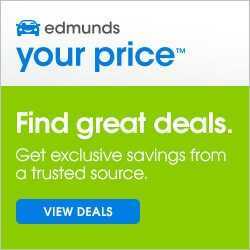 Schmidt was VW's General Manager of the Environmental and Engineering Office (EEO) from 2012 to 2015, in Auburn Hills, Michigan. There he was the liaison between Volkswagen and the EPA and California Air Resources Board (CARB). The FBI complaint states that Schmidt traveled back to the US in 2015 to meet with regulators to answer why VW diesel cars were spewing out 40 times the legal limit of noxious toxins, where he allegedly lied to and mislead the regulators. Eventually according to the FBI, Schmidt's lies could not explain away all that extra pollution the VW vehicles were spewing out, so VW was forced to admit they used an illegal defeat device, which detects a vehicle is under test by CARB or the EPA, and emits only low amounts of emissions which passes the regulations and qualifies for a certificate of approval. Once the emissions tests are completed, the car detects this and switches back to spewing mode again. Is this guy crazy? Why did he risk flying to the United States? I can't help but think was this guy out of his mind to risk a flight to the United States and risk getting arrested. Reports state that many VW employees did not enter the United States this week to attend the North American International Auto Show for fear of being arrested. So why did Oliver fly here? Was he so arrogant he thought he would not be caught? Or maybe he genuinely thought he was not under the microscope of scrutiny of the FBI anymore. Either way he was caught by surprise, on your way to a flight back to Germany one minute, and a half hour later you're sitting in a jail cell at the Broward County jail. Man, he was this close to freedom forever! I was a little suspicious as to how all this played out, and my guess is that they must have been tailing him, and when he landed in the U.S., he practically handed himself to the FBI on a silver platter just by arriving here. In my opinion, this would explain the timing of the FBI complaint that was filed on December 30, just a week before his arrest. The poor guy probably had no clue what was going on, or any reason to think he was going to be arrested, since he had cooperated with the FBI in previous meetings overseas. Presumably once the complaint was filed on December 30, by FBI Special Agent Ian Dinsmore, a Federal arrest warrant was presumably issued, and he most likely ended up on a no-fly list. Try to board a plane when you're on the no-fly list and see what happens. While looking through Schmidt's booking record, I noticed his date of birth is January 9, 1969, no other news story mentioned this, so this is exclusive to us here at CarBuyingTips.com. But what an unbelievable coincidence to add to this international story of intrigue, his first appearance before a federal magistrate was on January 9, 2017 on his 48th birthday! I can't think of a better way to spend my birthday than standing before federal Magistrate Judge William C. Turnoff in his 11th floor chambers, begging not to go to jail. His lawyer tried to convince the honorable judge that Oliver Schmidt will not run, but the federal prosecutor apparently was able to convince the judge that he is a flight risk because the judge ordered the shackled former high level VW executive to be held until his next hearing this Thursday. Happy birthday Oliver! I doubt that birthday cake is on the menu at the Federal Detention Center in Miami though. What a wild birthday weekend it has been for Mr. Schmidt. First he was a guest of Broward County Sheriff Scott Israel's wonderful 5-start resort, known as the Broward county Jail, where he spent Saturday night. He must be a high roller though, because next he was chauffeured down to the Federal Detention Center in Miami for much classier digs. My guess is that after his next court appearance on Thursday, the feds will want him moved back to Michigan, the original scene of the crime, and be prosecuted up there. 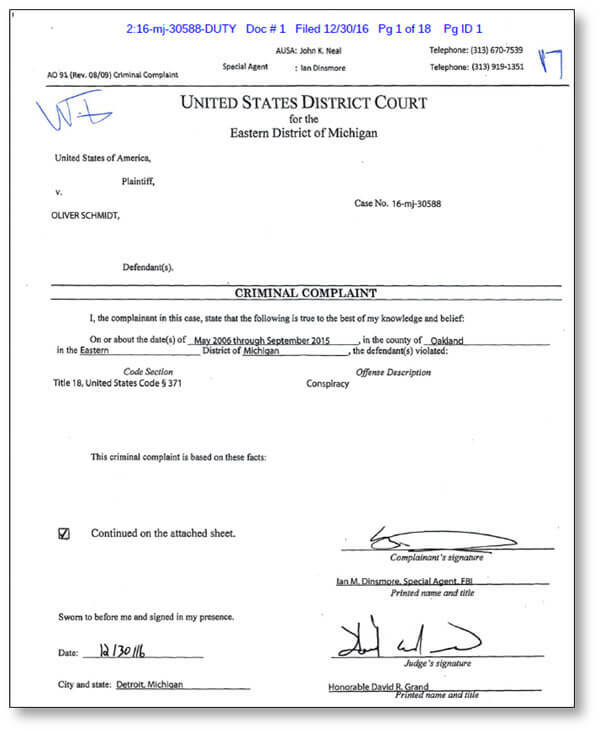 In the FBI's unsealed complaint issued on Monday, it identifies James Liang as a Volkswagen employee in the engine department who plead guilty on September 9, 2016 to conspiring with VW employees and others from 2006 to 2015 to defraud customers purchasing new VW cars, and violate the Clean Air Act. Liang agreed to cooperate with the government in exchange for the possibility of a lighter sentence. No immunity for him however. But wait, there's more it almost gets comical here. The FBi is naming 2 other anonymous "cooperating witnesses" from VW's engine department, whose cooperation with the investigation is producing immunity for both of them. Apparently they must be small fries, not worth the Federal prosecutor's time. I like how they named them Cooperating Witness 1 (CW1) and Cooperating Witness 2 (CW2). Hey, it's my old beer drinking buddy CW! That rhymes with VW and George W. I find the names which the FBI chose rather bland and generic. You'd think the FBI would come up with some flashier pseudonyms for their witnesses like "Hillary Clinton" and "Donald Trump". This is like a major cocaine bust, poor Schmidt everyone is rolling over and ratting out everyone else. Don't be surprised to see many more big heads roll at VW, because some of the claims made are very serious, alleging that top level executives were informed about the cheating, but blessed it, buried it and kept selling new diesel engine Volkswagens in the United States in violation of the law. One thing for sure, is that Oliver Schmidt's current promoted job at VW is in jeopardy in Germany, where he is the principal deputy of the head of engine development at VW's headquarters in Wolfsburg. How he got promoted after the 2015 Dieselgate scandal is beyond me. According to the FBI complaint, witnesses Liang and CW1 stated that the VW employees at the engine development department in Germany realized early on in the development of the EA 190 2.0 liter Gen 1 diesel engine that they could not meet the United States' strict NOx emissions standards. So the VW employees then designed and implemented the defeat device to trick regulators from the EPA and CARB when they tested Volkswagen cars. Here's the crux of the crime here. The witnesses confirmed that VW employees designed the defeat device so that it could determine if the VW car was undergoing emissions testing on a dynamometer, i.e. a "dyno" test, then it would cut off the engine emissions to pass the test. The defeat device could then tell if the car was back on the road again and open up the gates of hell to let all the NOx pour out again. This testimony of the witnesses is crucial, because it demonstrates that this was not some engineering goof, or a part failure, or a bug in the software, this was a deliberate act of deceit and fraud if the witness claims are true, this is some large scale very sinister behavior. This sounds to me like a mini Manhattan project. This can't just get pulled off by a couple of guys, this seems that it must have been a group effort, lots of people involved, which is why I expect many more heads will roll as the FBI peels back more layers of the onion. The FBI stated that in 2014, Oliver Schmidt learned of the study by ICCT and West Virginia University that pointed out huge discrepancies in the VW diesel engine car emissions during road testing. He then wrote an employee stating "It should first be decided whether we are honest. If we are not honest, everything stays as it is." Schmidt also emailed the then-CEO of Volkswagen GOA and another employee, warning of the risk of them getting hit with a $37,500 fine from the EPA for each vehicle. He stated "Difference between street and test stand must be explained. (Intent=penalty!)" The FBI complaint against VW employees gets more condemning The hits just keep on coming folks. The more you read through the complaint; your jaw just drops at the audacity of the VW employees. It states that they strategized ways to conceal the existence of the defeat device, while appearing to cooperate with regulators. The complaint also states that in July, 2015, VW employees presented to VW's executive management in Wolfsburg, Germany about the defeat device and assured the executives that the EPA was not on to them and that they would be OK, so the executives authorized the continued usage of the defeat device in order to receive certification for their 2016 models. During a meeting with CARB investigators demanding answers on August 19, 2015, witness CW1 spilled the beans and told the CARB regulators about the existence of the defeat device. That was it, the cat was out of the bag, and on September 3, 2015 a VW manager had to come clean about their dirty engines. Holy cow, talk about loose lips sink ships. The rest is history. Why in the world VW even allowed CW1 to attend the meeting is beyond me, since they had discussed not letting him attend that meeting in the first place so he would not have to lie. Just as I was writing this, VW announced it has negotiated a preliminary $4.3 billion settlement with U.S. regulators to make the criminal charges go away and put to rest its dieselgate emissions fraud troubles. This includes VW pleading guilty to criminal misconduct. This still has to be approved by a judge and I think this is just the beginning folks and you are likely to see a lot more arrests going forward. One thing is for sure, you probably won't be seeing to many VW employees from Germany traveling to the United States any time soon. What are your thoughts on this? Let us know.